PAINT ME A MEMORY… | Jots from a Small Apt. “What a strange thing is memory, and hope; one looks backward, the other forward. The one is of Today, the other is the Tomorrow. Bold, Jots. Very bold. 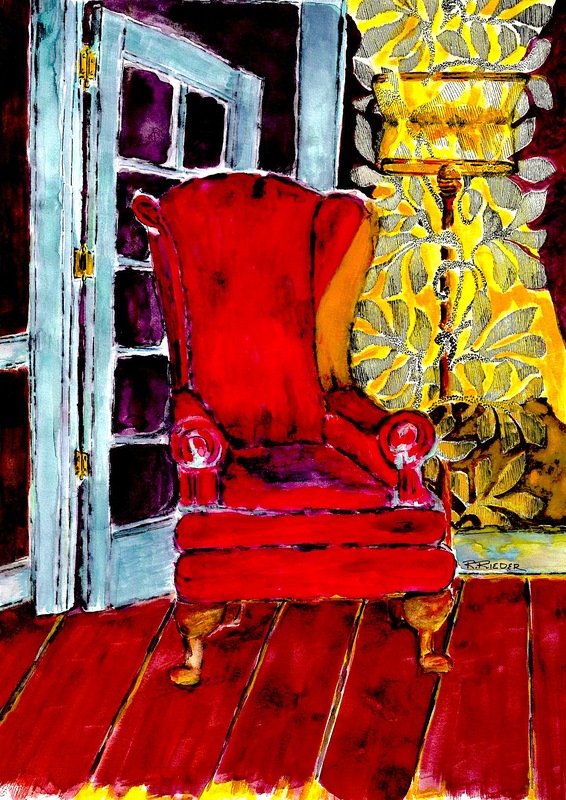 I want to plop in that red chair and read a novel. Fabulous vibrant painting – love it! Wonderful post! I love this inviting red chair, well done, Raye. Interesting when taking a closer look to see the detail. Cheers to your effort! Is this chair in your past, present, or future? Could write a brief book on that question, aFA, but since the lateness of the hour bids I clean the cat box…you are spared. You getting another douse of snow this week I see from weather reports. Thinking hard that Spring will eventually come to us all…everyone. Hopefully a chair of good stories. The latest storm will go to my south, but I see your area got quite a punch this weekend. Be safe! Looks most inviting and warm. And the colours are fantastic. Looks like a great place to watch the world from. So rich, these memories. Lovely. It takes a pretty impressive chair to balance out the lamp light. Beautiful as always, plus the painting’s quite nice. from guayaquil restaurant that closes at 111 and it’s t minus two minutes til closing! hotel has old fashioned outlets so the computer battery’s all but dead! Memories are like a fine painting, creative, and subtle, and shaded to a more pleasing form, and not at all like a photograph, with every detail just so. Nicely done! I’ve always wanted a nice big comfy red chair! Have a juicy and comfy week-end! So rich…Love it! In art school, we would call it a luscious painting. Like the Red Chair painting. Life is but a bowl……..you know the rest, BTG!! Nice weekend for you and Mrs. BTG, I hope.